If it were not for Sergei, then the church would either remain devoid of worshippers or closed most of the time. Source: Archive photo. Sergei Yeremeyev is a former Muscovite who has lived on Olkhon Island in Siberia’s Lake Baikal for the last seven years. In the 1990s he worked for a major global company, carried a gas-pistol in his jacket pocket, and used to play at the casinos. Nowadays he is a simple verger at a church and dwells with his family in a cramped log cabin near the church. Sergei rises at seven each morning. He goes to open the church and waits to see how many will come to pray. This is the only church on the island. If it were not for Sergei, then the church would either remain devoid of worshippers or closed most of the time. He built the fence around the church himself, found a church-bell, and helped build a bell-tower. To look at him, one would say he was around 35. He has several diplomas, including one from the Sorbonne. He is fluent in English and French, and understands Greek. Long ago Sergei worked as a headhunter – he worked in personnel recruitment. During his university vacation, Sergei packed his rucksack and set off on the road. “Where y’going?’ drivers would ask him. And he answered honestly: “To Holy Mount Athos.” He began his journey with 500 francs in his pocket, but ended with a thousand. The drivers who offered him lifts not only gave him medicines, but money too. "I got sick of it all," said Sergei about Moscow, Paris, education and languages. Source: Cornelius Langenbruch. 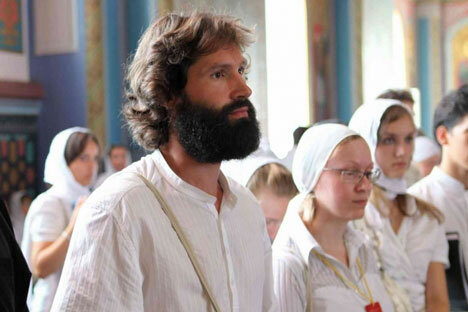 Eight hours of prayers, eight hours of work, and eight hours of rest – it was the daily regimen at the Holy Mountain. By degrees, Sergei’s interests changed. He stopped blowing his money, stopped going to casinos, and stopped associating with many of his friends. One of the monks at Mount Athos suggested that he should stay there – forever. Yet Sergei declined, saying that he was not ready for that, and returned to Moscow. However, it turned out that he could no longer live in Moscow either. He needed to escape. Nastya, Sergei’s wife, stands by the church doors, talking to a tourist from the Netherlands. “Really, you’re truly happy here? Well sure, maybe you could stay half a year here, a year tops – but staying here forever?” the tourist muses aloud. Even so, she packed a suitcase and followed her husband to the tiny village of Khuzhir – thus earning the nickname “Mrs. Decembrist” from her parents (The ‘Decembrists’ were Czarist-era political prisoners, sent to Siberia for attempting a coup in December 1825. Many were former officers and noblemen. Society expected their wives to divorce them, but, in fact, several followed their husbands into Siberian exile). Nastya got used to her new surroundings quickly – she learned how to milk a goat, grow cucumbers and tomatoes, had two children, and began to sing in the church choir. “Do you know how I derive real pleasure? From walking barefoot through the grass, from the fact I can go on foot everywhere, from breathing the sea air every day. And also that I don’t have to save my money for years and years to get an apartment in Moscow,” says Nastya. Baikal, the pearl of Siberia. Source: Cornelius Langenbruch. Sergei's wife packed a suitcase and followed her husband to the tiny village of Khuzhir. Source: Family archive. To brighten their lives and help travelers in the process, Nastya and Sergei opened a hostel called Philoxenia – from the Greek word for “hospitality.” The hostel is across the road from their house and just a few steps away from the church. Visitors from all over the world stay in the hostel all year round – for free. While Sergei is hauling buckets of water from barrels to the greenhouse, he tries to explain a few things about their income. The peel of the church bell rings out over the village. Sergei drops his bucket, and runs to the bell-tower. There his son and daughter are playing their favorite game, seeing who can ring the bell the loudest. But the slightly rough sound does not bother people. On Olkhon, they are pretty laid back about things in general.